I found that if I select directly from D to manual mode without selecting S first, the rev is lower (so car is quieter) and the exhaust pop is less noticeable. Agree on the fake exhaust but let dont forget there are good reason for not having the exhaust pumping directly out the back. I have a few kid and the little one is just exactly at the right height where the exhaust will blow directly into her face if she was near the back of the car so that goes with any pedestrians walking near the car in city etc. Lets not forget the latest research regarding exhaust fumes plus the benefits of not needing to clean the damn tips. Maybe perhaps they should have keep it open thou rather than blanking it out completely but still have it point down. That would have been better I think. With the sound, everyone taste for exhaust note is very different at the end the day. I too was first originally looking at the amg 3.0 bi turbo engine before I went with the SQ5. For me personally, the SQ5 was exactly what Eddie said, subtle and civilized so not over the top. The mercedes and the now M40i are a little on the louder side which was very additive during the test drives but the SQ5 sounded to me more refine. For an S model, i recon the Audi has got the sound pretty good. But the 2.9l RS4/RS5 are a little too quite for an RS model and need to be tuned up a bit more as it sound a little to similar to our S model. Last edited by Wires; 02-05-2019 at 02:52 PM. Some thoughts on original poster's comment. I think if the exhaust were to exit out the back, the sound would be less pronounced, rather than the reverberation effect that is heard with the muffler tips dumping directly at the ground. I no audio engineer but the sound waves bouncing off the ground and then to the car's underbelly? Nevertheless, I like the sound. But fake tips? I just got to comment with the quick picture below. 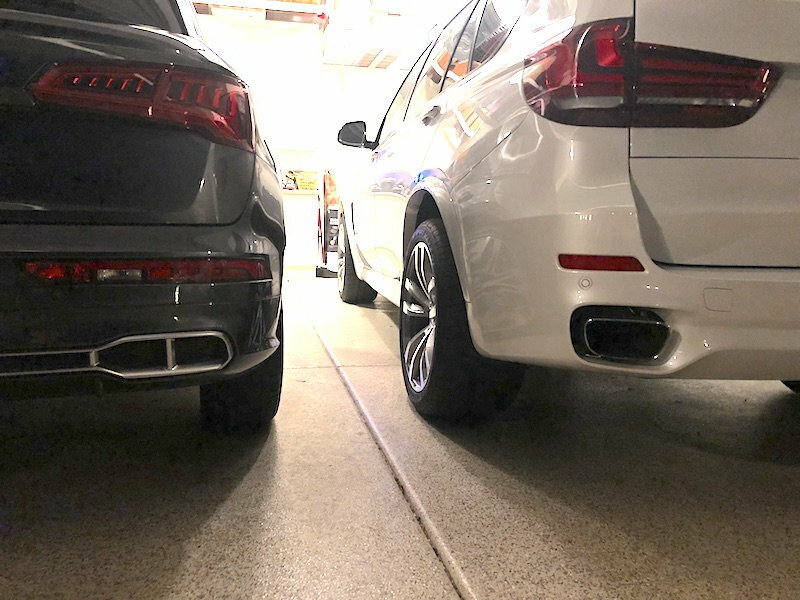 For my taste, the blacked tips on my BMW X5 is sort of a badge-of-honor. It shows me that I drive a living, breathing, engine and on cold days like this, the smoke pouring out of both exhaust tickles my the kid in me (and I'm an old senior). Exhaust height? Yes, your little one's safety is paramount. Not so much the exhaust gas but how hot the exhaust tips get (the BMW's hot to the touch). That might be a hazard, of course. I think the fake tips is how they transition a similar design into the EV market with minimal changes to styling while trying to maintain customer acceptance to the change. I like the look of the "dual exhaust" as well, but no vehicle I've owned in the past 20 years has had true dual exhaust. It's usually one pipe to a large muffler than splits into two tips at the rear. Doesn't matter if it's a 450HP pickup, 300HP BMW, or Audi. One common exhaust back to a single muffler. Our 2000 Mustang was the last one that I owned that had actual dual exhaust. I think the marketing strategy, getting us use to the fake exhaust, is the Audi plan to bet the buying public use to the look. I'm still old school and prefer functioning exhaust tips. Nevertheless, I do love the sound of the SQ5. I think the engineers got a unique sound for a small V6 turbo car. To your observation on the "dual exhaust", the single main pipe splitting off into two tips at rear seems to apply to the 2.0l 4 cylinder Q5. Our SQ5, however, has dual exhaust (2 cats, 2 downpipes, 1 common resonator, 2 rear mufflers, 2 tips). Attached is a vendor's pic for the 2017 S4/SQ5. I've peeked at my 2018 and its similar except for the down facing muffler tips. I might be wrong but I'll check later this month when I'm in for an oil change. 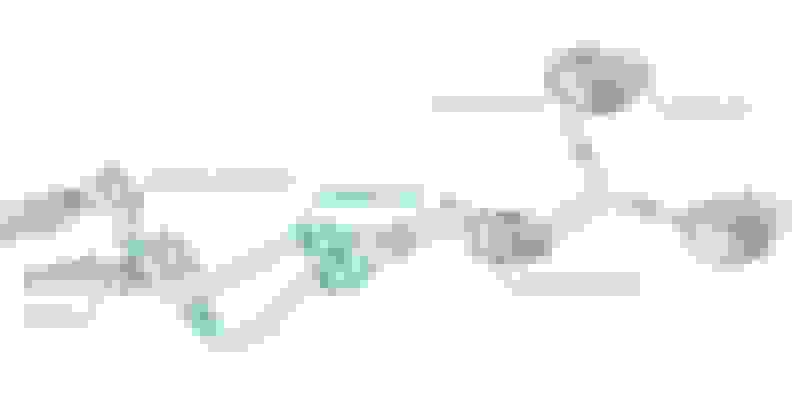 Of course the current designs for dual exhaust don't look like those of vintage muscle cars but I think its as dual as we're going to get considering all the packaging constraints and the need for a common resonator (to cancel out drone). My last BMW V8 and Lexus V6 had dual exhaust on both sides but they met in the middle for that common resonator. Single Turbo must have single pipe into and out of the turbo. Earlier supercharged 3.0 can have true dual exhausts. It is all irrelevant as long as pipes are large enough for the necessary volume. None of the Q's have bi-turbos. 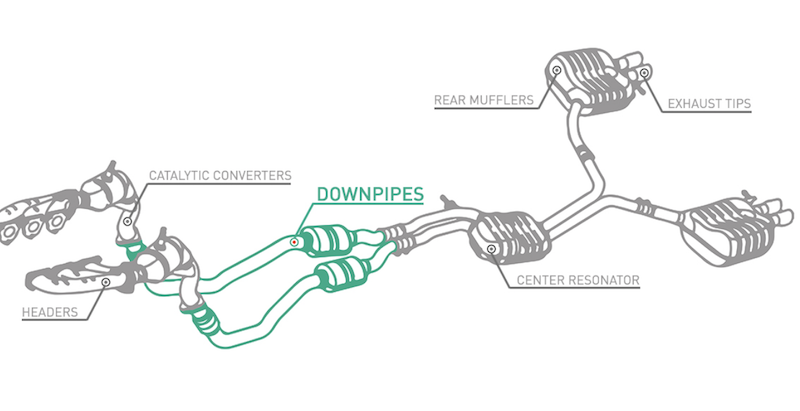 This is what I was going to post, but I did glance under my 2018 SQ5 and it appears to have dual down pipes and cats to a common resonator and then dual back to a shared muffler with two tips. I didn't pop the hood to see how they split the turbo output into two (and have no clue why they would bother adding this extra cost unless there isn't enough space to put one large cat so they need two. Image attached. Ahh...you're right. I forgot that the Audi V6 has a single turbo hot-V set up so while its fed by both exhaust banks, it'll exit post turbo into one (big) manifold. 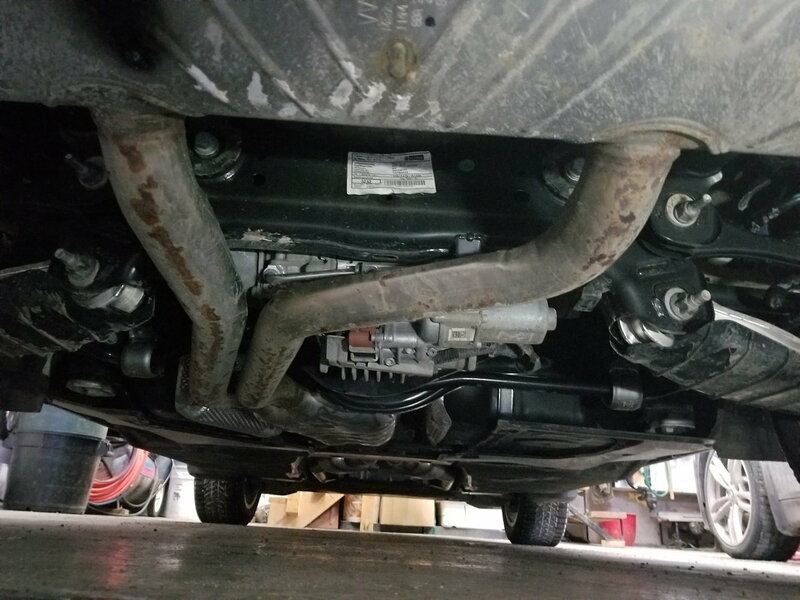 Then it splits into two 2 cats, 2 downpipes, 1 common center resonator, and then back out to two mufflers with down turned tips. My photo (post #26) is then an error, not the hot-V turbo 3.0 we have in our SQ5. Perhaps it was for the previous years' supercharged V6. Sorry for the fuzziness...I'm new to Audi and haven't seen to many illustrations of our engine and exhaust layouts. My old BMWV8 was twin turbo, Hot V layout but with dual conspicuous dual exhaust. No merging into a single pipe. Even my old Lexus GS350, a non turboV6 had simple dual exhaust. I assumed the Audi would be the same. But to your original ponder on why they (or the auto engineers) would split the turbo output into two, it might be a matter of better flow, (since, in tuning theory, velocity through two properly designed pipes are better than one big one). So maybe engineering trumps cost here? No worries, I was just as confused. With NA engines, the dual design was meant to draft each bank for less restriction and greater power output. A center "X" pipe was inserted to merge the banks so that the pulses from each cylinder would create constructive flow and not standing waves in the exhaust which looks like of like a blockage. I would have thought once you ram them all into a large turbo, (which looks a like a giant blender), that a post split is just pointless for a performance standpoint. The design is definitely a hold over from the supercharged SQ5's, and maybe there isn't enough room to put in the more "logical" single pipe (it would have to hang lower with impacts air flow under the vehicle, or recess higher which would impact cabin space). Might be engineering won just to hit the other marketing targets.